Parenting can be hard. We are always trying to teach them right from wrong, how to behave in public, and ways to make choices that define them as a person. However, above all, the most difficult part of being a parent is letting them complete their own projects. You know the feeling…they are contently working on decorating a picture for a contest at school and paint is everywhere and the colors are wrong. Before you completely snap and take control, take a deep breath and try one of these tips for effectively not completely doing it yourself! Be polite. A simple suggestion such as “Honey, I think the eyes should be green, not red” will go much further than blatantly pointing out the error. In all odds, it is actually not an error, just a neat way of giving the picture some pizzazz. Do the project with them. No, do not take over the assignment, but simply get the identical materials and create one of whatever they are. They may look to you for guidance and see that coloring in the lines must be the right thing to do since you did it! If you do not have the materials for your own project, sit down ahead of time and help them make a plan of action for their project. Don’t compare. Each child is different, so comparing them to others is simply not fair. Yes, another classmate may color the puppy brown, which is standard, but your child’s polka-dotted puppy is a way of showing their uniqueness. Creativity is a gift! Give friendly pointers. Maybe a kind pointer here and there will help them not completely derail while working on their project. Embrace their gift or love for the arts! 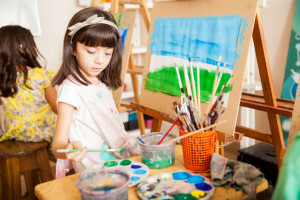 If your little one truly sees art as art, and has a talent for it, embrace it! Get them enrolled in art classes or enroll them in one of our camps. Finally, be like Elsa and LET IT GO. If they are happy with their finished product, let them proudly carry it to school and show it off! Keep in mind that one day you will be dealing with relationship drama, eye rolls, and not being that cool and the wild painting from third grade will seem trivial…and missed!